Tube cleaning, testing, plugging & retubing tools for boiler, heat exchanger & HVAC work. High quality industrial strength sockets, adaptors, slugging wrenches and accessories. State-of-the-art field machining/heat treating equipment for tube/pipe work and onsite equipment repair. Quality in-line/square drive hydraulic wrenches for 0-10,000 ft. lb. torquing applications. Hydraulic tensioners & hydraulic nuts. 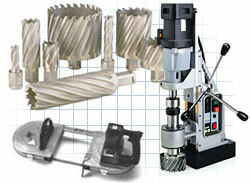 Mag drills, band saws, drills, burr bits, saws, hammer drills, electric motors. Innovation and high quality are synonymous with our Pneumatic and Electric Industrial Power Tools. We carry a wide range of portable magnetic drills, pneumatic and electric concrete core drills, air powered concrete saws, hydraulic, electric and pneumatic band saws, air chain saws, air hack saws, reciprocating saws, concrete grinders and metal finishing tools for construction and industry. Additional pneumatic, hydraulic and electrical driven equipment can be accessed through our home page, search feature or indexes to the left.